SHOP WITH CONFIDENCE, enjoy FAST 24 hour processing and EXPERT Packaging to insure SAFE Delivery! This is a USED Vinyl Record, I have graded the vinyl Acceptable and it played Acceptable with no skips or stalls! This was PLAY-GRADED and if you do not play the records you buy, please do not judge my grading, since the sound is a big part of my grade. After all, you can't listen to a record with your EYES, right? PLEASE ASK QUESTIONS BEFORE BUYING. The cover is in very good condition, The original A&M Records sleeve is included. 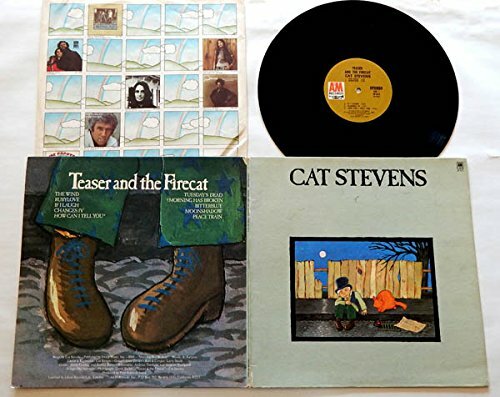 Cat Stevens, the Folkster, the Rockstar, the Poet. Solid Gold Hits of the 70's! The vinyl is graded Acceptable and it played Acceptable with no skips or stalls. The deadwax has "STERLING LH" etched into it. The LH is for Lee Hulka! The gatefold cover is in Very Good condition. The orignal A&M Records sleeve is included. Includes the hits "Morning Has Broken" "Moonshadow" Peace Train"
If you have any questions about this product by A&M Records, contact us by completing and submitting the form below. If you are looking for a specif part number, please include it with your message.